An excellent sequel of awesome racing game Dead Paradise. In the past your hometown was called paradise. But since it turned to a place of death and starvation it's nothing but mayhem. Take up your last chance to reach the hog heaven at zone 51 whereby heavily armed bad guys are chasing you to kill you. You must gun down their cars and bikes using your powerful weapons and driving skills. Multiplayer, cooperative online zombie shooter. 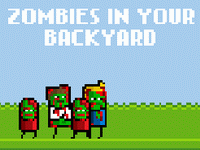 Hordes of zombies, levelups and bonuses. Protect your tower from rotting zombies. More and more keep coming, blow their brains out quick!